So read on if you want to know more about public transport fares, transfers and getting to and from Toronto Pearson airport! Public transport, or transit as they call it here, is operated by the TTC (the Toronto Transit Commission). The TTC operates an extensive network of buses, subways and streetcars (trams) and thanks to our good friend Wikipedia, we know that they run North America’s 3rd most heavily used public transport service. 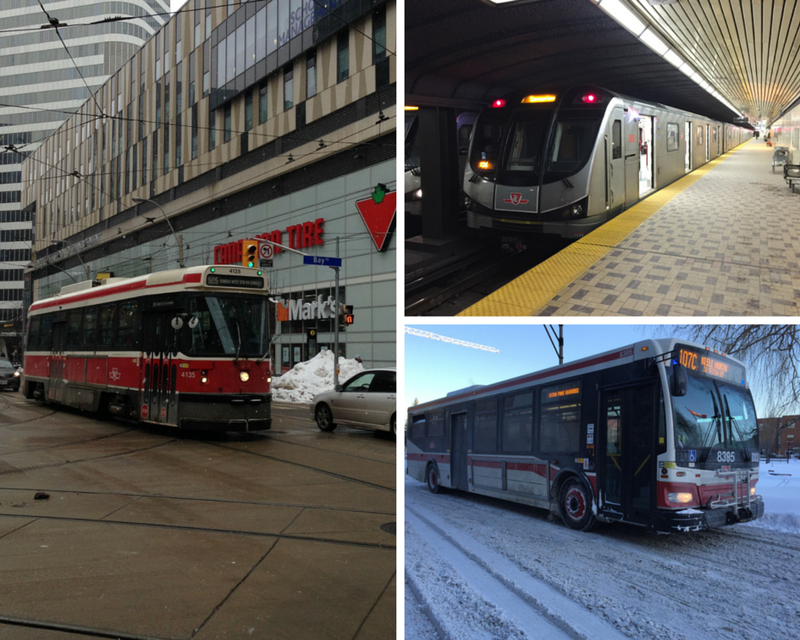 Much like us British like to talk about the weather, Torontonians like to talk about the TTC. In particular, they like to slag it off and confidently ask you that surely it’s worse than British public transport. One trip payment via tokens. Tokens are worth $3 each. The tokens are weird. 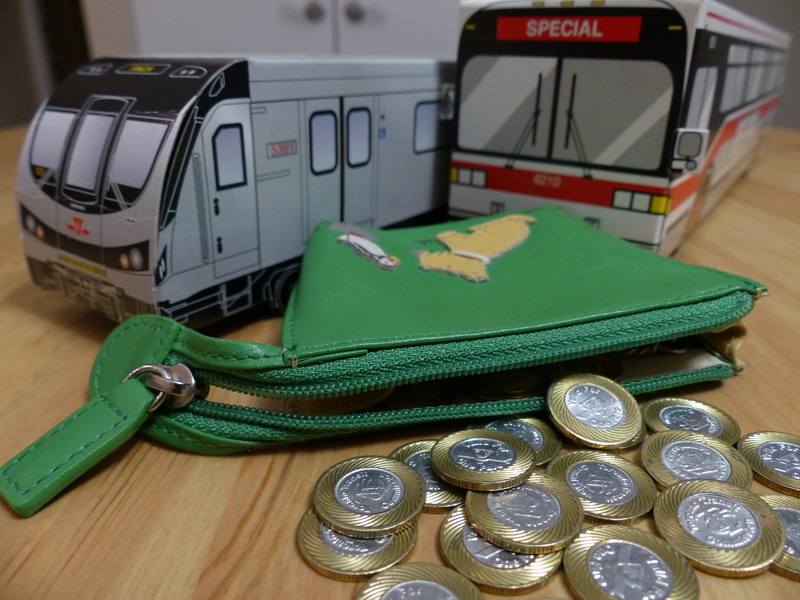 They can be bought from ticket booths at subway stations (some stations have ‘vending machines’ too), and their appearance is not to dissimilar to a miniature £2 coin. They are cheaper than a single $3.25 cash fare, but depending on the number of journeys you expect to make in a certain time period, then a daily, weekly or monthly (Metropass) pass might be cheaper still! Day passes are pretty amusing too. Resembling a giant lottery scratch card, the staff at the ticket booth will scratch off the day and month that your pass is valid for, before then signing it to validate the pass. All seems a bit old school if you ask me. The TTC have clearly considered this, and so nowadays, there is also an e-ticketing option too. If you know you’ll be using the TTC a lot*, and that you’ll be in Toronto for at least a year, consider committing to the 12-month Metropass Discount Plan. 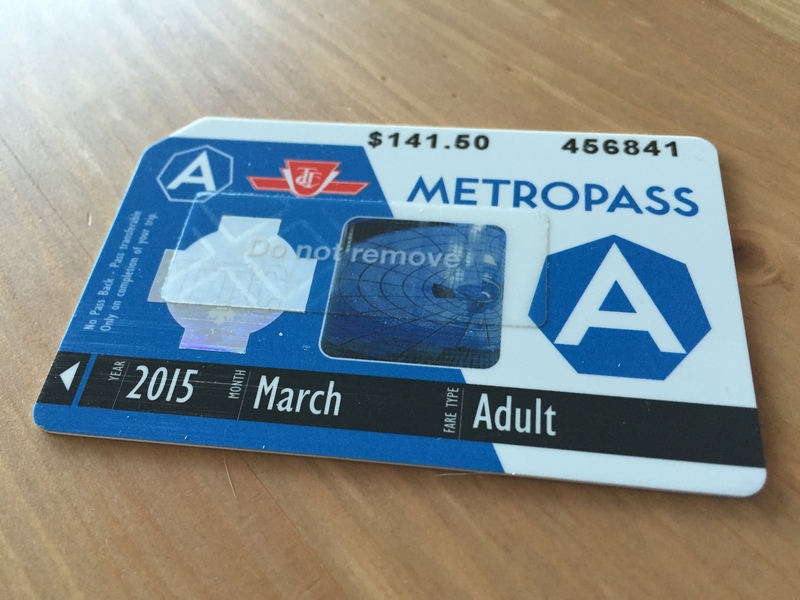 This reduces the Metropass cost from the standard $146.25 to $134 per month. Full details and terms & conditions are available on the TTC website. *So what counts as using the TTC a lot? 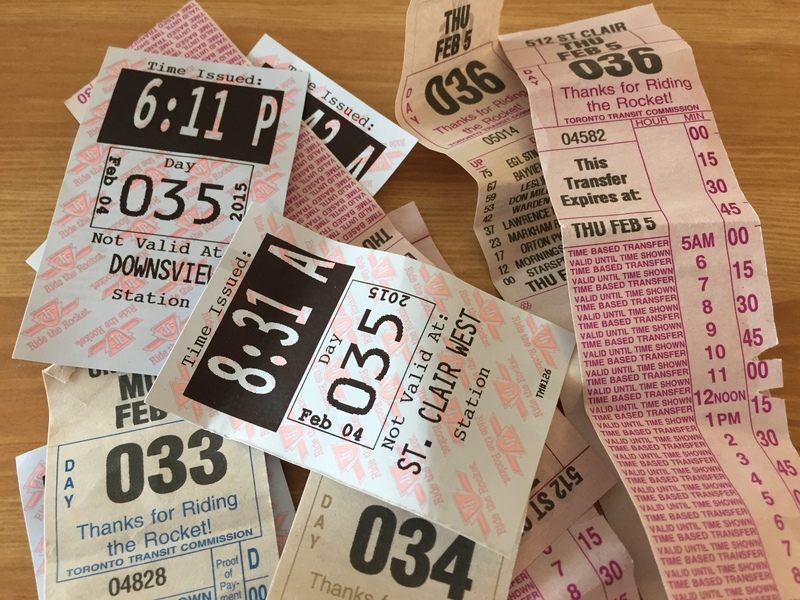 A normal Metropass only becomes cheaper than tokens if you use it at least 49 times a month – that’s to and from work 5 days a week, plus an additional 9 trips. With a MDP Metropass, you’ll have to make at least 45 trips a month with it, for it to become cheaper than tokens. Want to travel from A to B on a journey that includes multiple buses, subways, streetcars, or any combination of those modes? Then you can make that journey for the price of one fare/token, providing that you pick up a transfer at the start of your journey, either from the driver or from a red transfer machine if you are at the subway. A transfer allows you continuous one-way travel on TTC services on that day. You can’t exit the TTC system and re-enter. The only exception is the 512 St Clair streetcar, which runs a 2 hour time transfer, thus allowing you to travel one way, get off go shopping or whatever you need to do, and then get back on the streetcar and travel back home without paying an extra fare, as long it’s within 2 hours. You can get on and off as many times you like, and go in any direction along the line. When connecting onto a new route, then you need to show your transfer, although if it’s a station where the subway, streetcars and buses are integrated, then you don’t need to do this – it’s assumed that you’ve already paid your fare (tut tut if you haven’t). Even if you aren’t transferring between routes, it is still worth picking up a transfer. Otherwise you don’t have proof of fare/payment, which might get tricky in the rare cases that there are ticket inspectors. You don’t need to pick up a transfer though if you have a day, week or month pass. The GTHA has a smart card system called Presto, which is a bit like London’s Oyster card. Just load the Presto card with money, and then use it to pay for your fares. It’s valid in places such as Brampton, Durham, Hamilton, Mississauga and York Region amongst others, on GO Transit and even in Ottawa 280 miles away! So what’s the catch? Well, it won’t be until the end of 2017 that the entire TTC network has full Presto compatibility. Check out this dedicated website, for further information. TTC runs the 192 Airport Rocket express bus from Toronto Pearson International Airport to Kipling subway station, from which you can then travel into downtown Toronto using your transfer. All this only costs the $3.25 cash fare (or you can use tokens or a pass if you have one), and the same route can be repeated in the opposite direction to get to the airport. The only issue is that like all TTC buses, the 192 Airport Rocket doesn’t give change, so you need exact cash, something which a first time visitor to Canada is unlikely to have. TTC fare machines, which accept all major credit cards, are now available at Pearson Airport, so you can purchase your fare before your board the 192 bus. In 2015 the UP Express train service between the airport and Union Station in downtown Toronto opened its doors for the first time. The journey takes 27 minutes. However, at $12.00 per person (or $9.00 with a Presto card), it’s more expensive than travelling by the TTC. We’d recommend that you assess convenience vs price vs time for all options, including the TTC, UP Express, taxis and even Uber, before deciding how you will get to and from the airport. Toronto is pretty big, yet it is just one part of the GTHA (Greater Toronto and Hamilton Area). As well as Toronto, this includes municipalities and towns such as York Region, Durham, Mississauga, Brampton and Hamilton. So does the TTC operate in these places? No! They each run their own public transport systems. That transfer which you picked up from TTC at the start of your journey, or your TTC tokens and passes, mean nothing once you travel in places outside of Toronto, so you will have to pay the fare for your new bus on top of the TTC fare you already paid. Some TTC services are contracted to start/finish outside of Toronto. Expect to pay a TTC fare (cash fare, token or a day/week/month pass) as well as a fare to the other municipality’s transit operator. So why isn’t there a region wide transport provider that overcomes all these border issues? Well there is one, sort of. 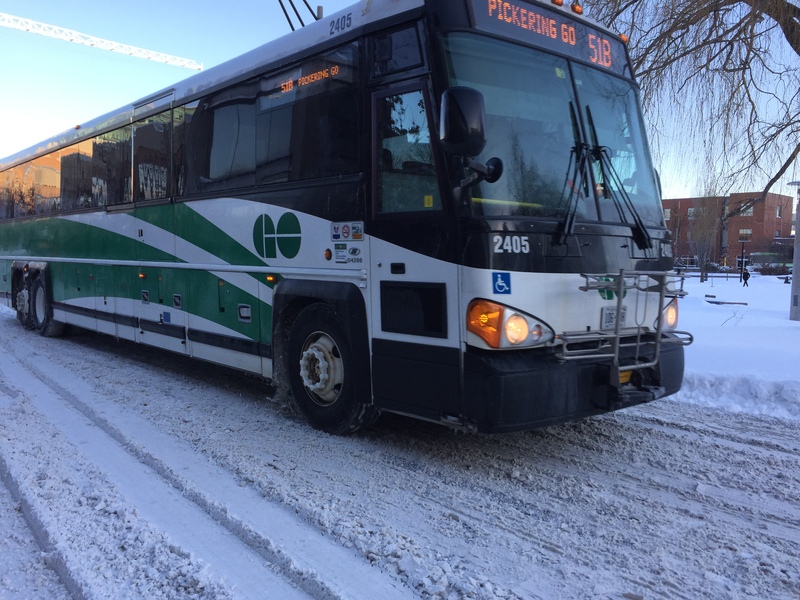 GO Transit operate trains and buses across the GTHA. However, these tend to be long distance commuting trains and buses rather than a local service, so not much use to a lot of people in Toronto. Alternatively, you can purchase a GTA (Greater Toronto Area) Weekly Pass for $63, that is valid on all TTC, Mississauga, Brampton and York Region Transit routes, if you need to travel in 2 or more of those areas. It’d be great if the public transport in the GTHA was run by one operator, like it is in the Greater Vancouver area, but it doesn’t look like it’s going to happen anytime soon! The system may be complicated in Toronto, but eventually you learn its ins and outs, and the service is generally very good. Heated bus stops in the winter wouldn’t go amiss though! This page was last updated in January 2017. Every care has been taken to ensure that the information provided is accurate. I moved to Toronto about 6 months ago and wish I had found this post then! Haha we found public transport so confusing when we first got here too!